Wishlists allows customers to create and add products to an unlimited number of wishlists. Wishlist adds a great value to your store. 1.Use the Joomla installer to install the app. 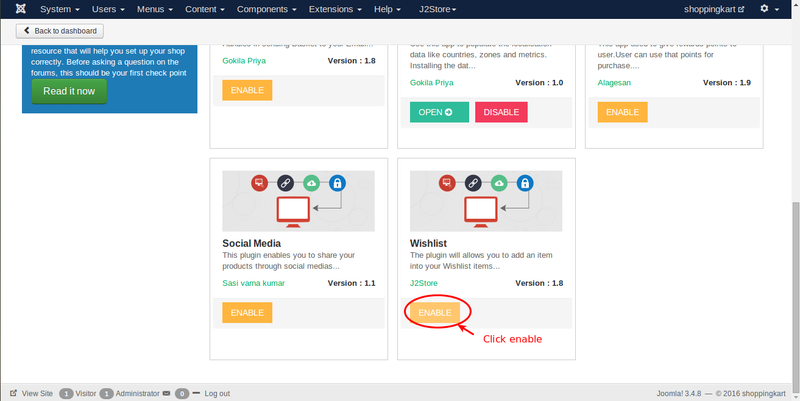 2.In the backend, go to J2Store Dashboard -> Apps as shown in the image below. 3.Click Enable in the wishlist app. 4.Once the app is enabled, click on Open to set the configuration for the app. Remove item after adding to cart : Enable this will remove the item from the wishlist once item added to the cart. Link products to: Choose where to redirect the customer when they click to view the product in the wishlist. If you use the J2store product list view, then dont choose to use the default article layouts. Main image width (in px): Enter the width of the main image in pixel. Enter link display text: Enter the custom text here will be shown in the product page. Enter link display icon (fontawsome icons eg.fa-heart ): Choose your wishlist display icon as font awesome icon. Enter link display to wishlist view: Enter the custom text here will be shown to wishlist view in the product page. Enable redirect to wishlist view: Enable this will redirect the customer to the wishlist view.